$300 is a good “mid-tier” price point for drones. At $100 or less you’re basically looking at toys – the drone equivalent of an RC car, good for children but not likely to hold the attention of older or more experienced users for very long. And as you increase the price over $300, you pretty quickly find yourself in the high-end range, which is going to cost you $1000 or more. That’s great if you’re a professional, but what about those of us who are somewhere in the middle? This list is for folks who have grown past the beginner stage but who aren’t yet ready to commit tons of money to something that breaks down in a strong wind. There’s plenty of drones here at the mid-tier, from racers to camera drones to toys. But this oversaturation means that it can be hard for newcomers to find the very best drones under $300. That’s why we’ve compiled this handy list of the top five. We’ve flown all of the drones on here and have rated them not just by number of features, but by overall usability and purpose. Our top drone isn’t necessarily the most advanced of the quadcopters on this list, but it is the one we think will be the most enjoyable for the most people. A drone is any aerial vehicle that is not flown by an onboard pilot. A lot of drones are also quadcopters, a specific type of aerial vehicle which (as the name implies) is kept in the air by four propellers – two turning clockwise, two turning counterclockwise. All quadcopters are drones, but not all drones are quadcopters. Drones are usually controlled with a radio transmitter (similar to an RC car) or with a mobile device. It depends where you’re located. If you’re in England, yes. In America (as of 2017) you usually only have to register your drone if you’re using it commercially – that is, if you’re using it in some capacity that makes money. You also have to meet specific pilot and aircraft requirements. It’s best to look up your local laws and regulations and make sure to comply with them. Where am I allowed to fly a drone? In the United States, you can generally fly your drone anywhere unless you’re within 5 miles of an airport, higher than 400 feet in the air, or over the White House. Again, though, it’s always best to look up the local laws and regulations of wherever you live, and we don’t claim to be any kind of legal authority on this issue. Do I need special training to fly a drone? 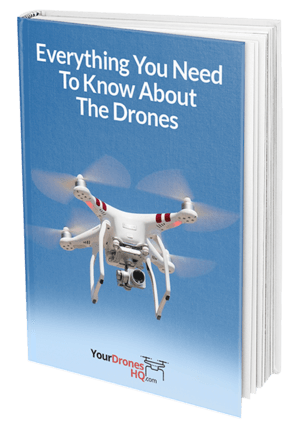 If you’re just flying for recreational or hobby purposes – which is most likely what you’re going to get with a drone this cheap – you don’t need any special training. However, if you’ve never piloted a UAV before, it will likely take you a little while to get used to the controls. You may wish to look for a more durable drone just in case you crash it while you’re still learning. Want to get into drones but weren’t sure where to start? This list is a great place to start – a mid-tier price point of 300 USD will get you very high-quality drones that are still fairly beginner-friendly. You won’t find a ton of amazingly high-end features here, but you will find excellent and easy-to-fly drones at a price that won’t break the bank. See the best price on Amazon.com or get Fast & Free Shipping from their Website at Altairaerial.com. This is another drone that doesn’t actually come with a camera, requiring you once again to set up your own GoPro using the provided action mount. But beyond that, the Blackhawk has just about every feature you could want in a recreational quadcopter. Multiple speed modes? Check. 6-axis gyro for advanced stability? Check. 360 degree stunts? Check. Want to control it with a mobile device? You can do that, with HD FPV streaming to boot. Prefer a traditional controller? The Blackhawk got that too. What’s more, this is just a solid drone overall. It has a transmission range of 300 meters, the most of any quadcopter on this list, and provides 15 minutes of flight time per battery, which is very good for a camera drone. It’s durable, stable, and fun to fly. Truly one of the best drones under 300! The Parrot A.R. 2.0, also known as the Elite, is a drone that’s absolutely jam-packed with great features at a price that won’t break the bank. Most of Parrot’s offerings are much more expensive and high-end, but with the A.R. 2.0 they’ve brought their reputation for great quadcopters to a more affordable product. This drone has a gyroscope for steadier flying, a magnetometer that can be used to check its position via the Earth’s magnetic pull, an accelerometer to measure its current speed, and even Ultrasound sensors which it uses to great effect in order to avoid colliding with buildings, trees, and other obstacles. It has a respectable flight time of 10 minutes per battery and a 130 meter range, which should be more than enough for anyone flying a drone for recreational or hobby use. However, the app controls can be a little difficult to get used to for anyone who learned to fly on a controller. Fortunately, the drone is very forgiving and the strong foam prop guards can take more than a few hits! Hubsan, like Parrot, is another well-known and well-respected drone manufacturer that’s really brought its A-game to the mid-tier market. The H501S is a great flier, able to fly for 20 minutes off a single battery and capable of reaching top speeds of 45 mph thanks to its powerful brushless motors. It’s also a pretty good stunt drone, capable of pulling off all kind of midair flips and rolls. In addition, while most drones only have one radio frequency, the H501S comes with both 2.4 GHz and 5.8 GHz. That said, this drone is definitely not recommended for beginners! It’s only got an 80 meter flight range, so you’ll need to keep it on a tight leash. And there’s no prop guards, so it’s nowhere near as durable as Parrot’s A.R. Drone 2.0. But if you’re already an experienced pilot who’s not interested in extras and is just looking for the best flier under $300, the Hubsan H501S is the perfect choice. In contrast to our last two entries, this is a great drone to pick up if you’ve never flown a quadcopter before. The 3DR Solo’s remote was specifically designed to work like a videogame controller, making it a lot easier to use if you’re familiar with that pattern. Most movements can be triggered with the push of a single button, and there’s lots of safety features like the automatic Safety Net and One-Touch Pause, which ensure that you can avoid potential crashes without having any understanding of how to fly your drone out of danger. And while the 3DR Solo doesn’t come with a camera, it’s great if you already own an action camera, particularly a GoPro (the company 3DR partnered with to make this quadcopter). The Solo is the world’s first drone to offer wireless HD streaming, charging, and exclusive GoPro control while in-flight directly to your smartphone/smart device from your GoPro. And you can even set up computer-assisted Smart Shots that’ll make your amateur videography look professional. While it’s one of the priciest entries on this list and certainly won’t be for everyone, beginners would be hard-pressed to find a better mid-tier drone than the 3DR Solo. The BLADE 180 is a powerhouse in disguise. The drone itself is tiny – small enough to fly indoors, which is perfect if inclement weather has kept you away from buying drones in the past. And as you’d expect, its light weight makes it easy to use and fly – a feature compounded by adjustable flight speeds and BLADE-exclusive SAFE technology. This technology makes it a lot more stable than a lot of its competition, and therefore a lot easier to fly no matter where you choose to take it. It’s also surprisingly durable for such a small piece of plastic and, as you’d expect, incredibly fast and aerodynamic. All in all, this is a great drone in the under 300 USD price range. Thanks for reading our ultimate guide to the best drones under 300 usd. Hopefully you’ve not only learned more about this great and expanding hobby, but you’ve also been able to make a good selection that suits your needs and wants. If you’ve got any questions or have another drone you think should be on the list, please let us know in the comments!